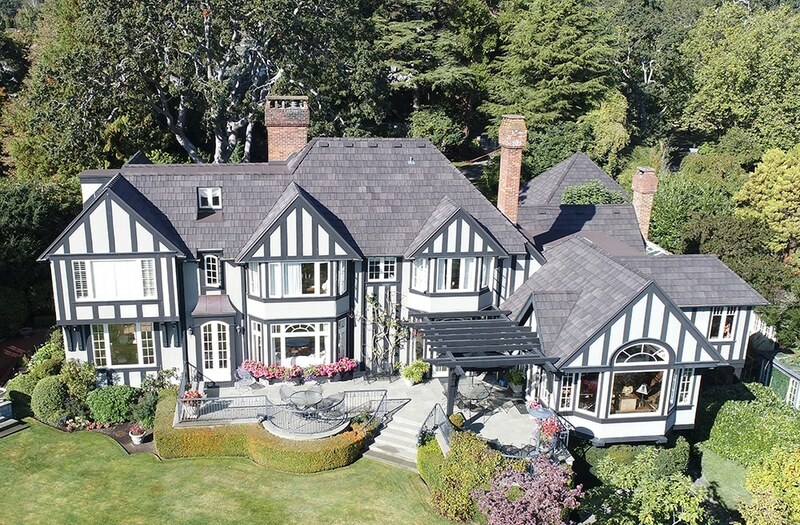 Homeowner Jane Danzo takes great pride in the appearance of her 1910’s “manor style” home in Victoria, British Columbia. She originally loved the look of her real cedar roof, but in recent years that look changed. That’s when she decided to invest in a composite shake roof from DaVinci Roofscapes. As Danzo decided to make the change to composite shake roofing, she relied on her roofer, Caleb Friesen with Custom Roofing, for advice. 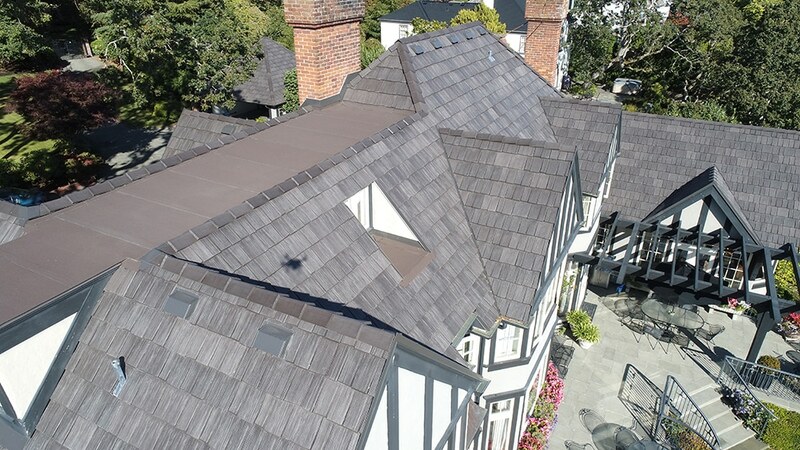 For this project, Frisen recommended Bellaforté Shake composite roofing tiles in a Mountain blend of colors. As Danzo discovered during installation of her roof, it’s the little things that make Bellaforté Shake such a remarkable product. The staggered edges, color variation and dramatic shadows all contribute to a truly realistic look. Streamlined, time-saving installation and a wide selection of color options all make Bellaforté a winning composite shake choice for a home. Designed with a snap-fit tile that creates a built-in rain gutter, Bellaforté simulated shake roofing tiles feature a leading edge tab that secures every tile to drastically improve wind performance. The 12″ tile width with multiple profiles simulates a multi-width, staggered rough hewn wood shake. 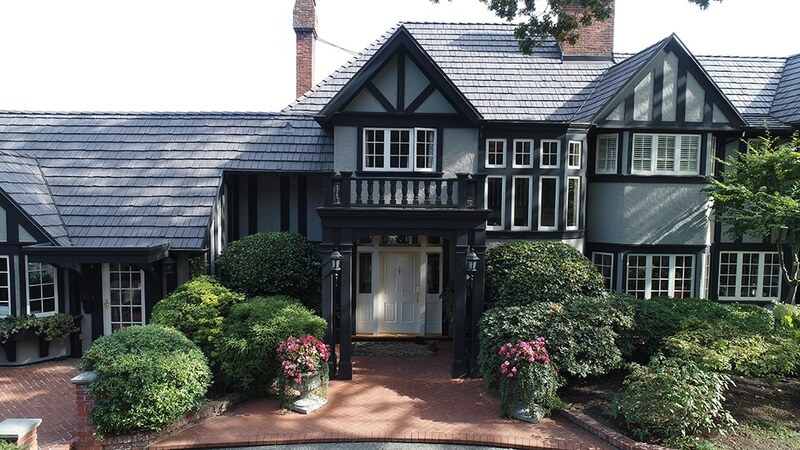 And, at 1″ average tile thickness, Bellaforté Shake designer roof tiles are reminiscent of natural jumbo shakes. Located near the ocean, Danzo’s 6,000-square-foot home sits on about an acre of landscaped property. While living in the home for almost four decades, the Danzos have done several renovations. The last was made to bring the overall home up to the highest possible standards to complement other homes in the neighborhood. “In the 38 years that we’ve lived in this house with major renovations and additions going on, we’ve never permitted a ‘trade’ sign on our boulevard,” says Danzo. “That is until Custom Roofing. Their discrete sign was appropriate, and our allowing it reflects on how we feel about this roofing company.